On sunny days, life happens around the pool. To enjoy the sunshine, or share an evening with friends next to the water, this relaxing space just needs personalising. Depending on the area available, several arrangements are possible. For eating lunch outside, a set of garden chairs and table makes an essential item of outdoor furniture which is available as much with a large table, or even an extending table, as with a small table for meals as a couple. A patio bar, or counter-height table, with stools offers a more relaxed bistro-style ambiance. Garden furniture with sofas and armchairs, or its range of designer chairs such as the very chic Pop-up XL, as well as its low garden table will, however, guarantee higher levels of comfort. 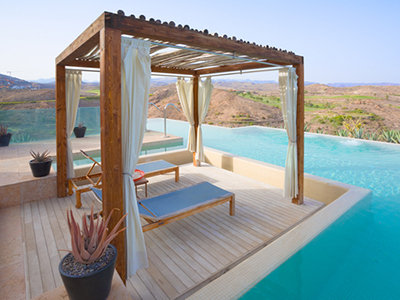 Beyond the dining area, it is a good idea to design a separate lounge space for sunbathing, reading or taking a nap, on a sun lounger or even a deckchair. To create a cocoon-like ambiance, a swing seat, this little hammock which offers a seated position, claims to be a chic garden seat, but it also takes up a lot of space. During the day, it is strongly advised to have something to shelter from the sun’s rays. The offset parasol is perfect for covering the meal table without getting in the way. The sail shade or garden arbour offer elegant alternatives in decor trends. In the evening, the outdoor lighting influences the ambiance. Garden lighting which reflects on the planting and water creates a cosy atmosphere. XXL candles can be intimate exterior decor. To arrange this space according to your tastes, it is easy to play with colours with an assortment of garden cushions scattered on an outdoor couch. It is easy to store them in a storage chest, and get them out as desired. To change your pool area into a true oasis, plants play an essential role. Depending on the geographic zone, flowers and shrubs can create an unusual ambiance. In the south, aloe vera, olive trees and cactus plants all symbolise the Mediterranean climate. North of the Loire river, it is better to have continental style plants. A climbing plant, such as fragrant honeysuckle, is perfect for decorating a pergola. A large pot of flowers is an elegant way to mark a boundary. Large bushes or a bamboo hedge for example, will protect from being overlooked whilst also acting as a wind-break. On the other hand, it is better to avoid spiky plants, those species which attract insects, and also those which lose their leaves. Which furniture for around the pool? The garden furniture must be able to combine comfort, aesthetics and high quality. As it is used every day, each piece must be able to be moved or stored easily, and also be easy to keep clean. 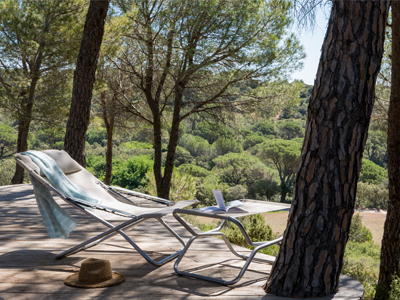 From the chaise longue to the sun lounger, seating must guarantee optimum ergonomics for peaceful relaxation. The relax chair from LAFUMA Mobilier, with a headrest and armrests, offers in particular a position called “Zero Gravity”, as it corresponds with the position the body naturally adopts when weightless, the legs and trunk forming an angle of 127 degrees. In addition, its fabric suspended by clips ensures excellent back support. 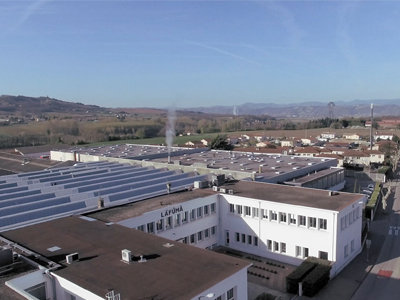 What’s more, outdoor furniture stands up to harsh conditions. It must resist bad weather and being exposed to the sun’s rays for long periods. The choice of material is crucial. Wooden furniture, from varieties of pine, eucalyptus or teak, have the advantage of being rot-resistant. Garden furniture made from woven resin is resistant to bad weather as well as to UV rays. It is also strong with its elegant wicker look which covers an aluminium or steel frame. These frames are very resistant to corrosion and to UV rays, as long as the steel has been treated and painted. 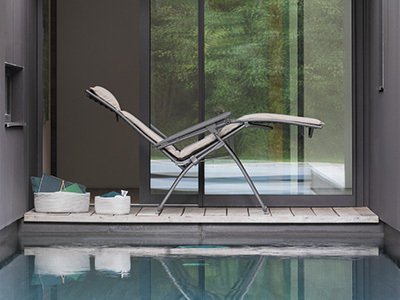 Armchairs designed with strong fabric are perfectly suited for poolside use. They are not damaged by splashing, as the open weave fabric guarantees them to be quick-drying. Garden furniture, such as the design chair are available in a wide range of shades, going from the colour anthracite grey, off-white or taupe, and also green or ocean blue. While tropical hardwoods and wicker offer a timeless style, these materials require regular maintenance. 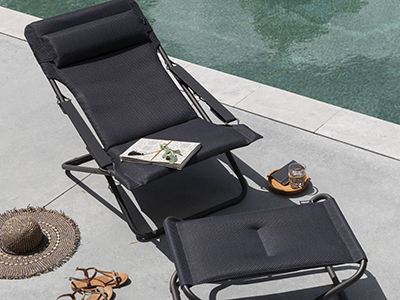 The transat or le sun lounger it reclines, and matches the footrest, form part of the essential relaxing items. They are perfect for a moment of reading in the shade. They can be placed in several positions for complete well-being. The sun bed from LAFUMA Mobilier let one fully extend for optimum sunbathing.. This outdoor chaise longue, which combines aesthetics and comfort, can be fitted with wheels or casters so as to be able to move it where one likes. Portable furniture folds very easily, which also means it takes up little space when not in use. To protect your tables and chairs, LAFUMA Mobilier offers a selection of storage covers at the end of the summer season; it is actually recommended to store all your outdoor furniture in a garden shed or a suitable storage area.